This is the standard, entirely logical response to the question, “If you had to save one thing in the event of a fire, what would it be?” Our attachment to our loved ones and our memories of them are paramount to our identities; the highs and lows, major events and shifting locations all playing their part in forging our character and place in the world. But what happens when that place in the world changes? When moving address, a whole new chapter begins and inevitably some significant possessions don’t make it over the threshold. There are differing reasons: a lack of space, a desire to downsize, wanting to break an association with a location, or having a partner who doesn’t appreciate the enormity of clutter that you’ve accumulated over the years. Or a combination of all. At what stage in life do you outgrow something? Usually it’s when we’re forced to examine habits by realising that they’re no longer contributing anything positive to our lives. Or a gradual awareness of not interacting with something that once dominated our time. It’s interesting to observe children’s habits. My six year old son has always loved toy cars and continually returns to world-building games with his oversized collection. Star Wars, Lego and Hexbugs will dip in and out of his attention but the cars always reign supreme. Occasionally he’ll rediscover a box of untended toys and dive in with a residual enthusiasm and affection. But it never lasts for long. The cars are waiting and they will have his unswerving devotion. We’re moving house soon so it’s not unexpected to learn what’s top of his keep-list. For his mum and dad it’s not quite as straightforward. We have little choice. Storage space in our new home is limited. I’ve written before about the reasons and benefits of downsizing. Applying it can be surprisingly liberating but that doesn’t take away from some of the emotional and nostalgic barriers that can arise. When I was my son’s age I fell in love with comics. 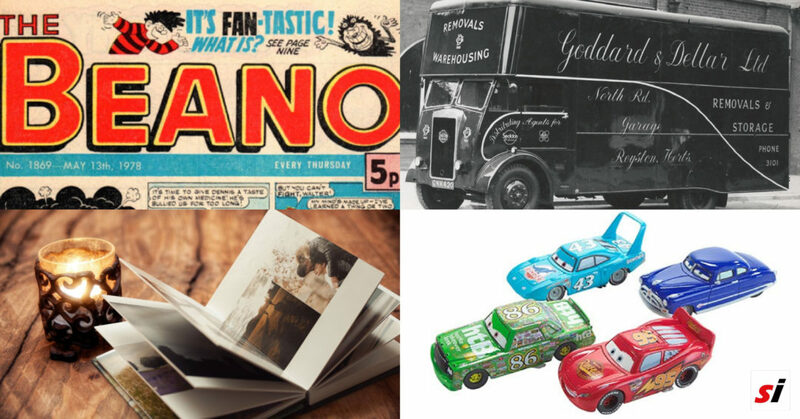 The likes of The Beano, Whizzer & Chips and Whoopee became constant companions. I loved the art, imagination and uplifting anarchy that they presented on a weekly basis. When I got older, my tastes changed but thankfully comics for older kids also existed with stories about wild sporting exploits and thrilling, futuristic nightmares. I couldn’t get enough and I continued collecting them. When my parents divorced, the comics I’d accumulated helped me through all the shock and upheaval. On top of the escapist entertainment on offer, they also provided a reliable weekly touchstone as well as being time capsules back to happier days. And as the years passed they continued to play a part in my life until I ended up writing comic strips for a well-known title. The experience in itself didn’t put me off buying comics, it was simply that my priorities had changed. As any parent quickly realises, your relationship with time is completely altered and any leisure pursuit becomes a luxury goal. Even though I stopped buying comics, I still had thousands of the things in my possession. And still do. But now we’re moving house it’s time to say goodbye to most of them. Like certain people who we encounter in life, it can be hard to let go of things that make a big impact. But we outgrow people and we outgrow things. And hopefully we can say goodbye to them whilst remembering the good times they once shared with us. And if we really can’t bear to part with them, we can always chuck our items into storage! If you enjoyed this blog then you can keep up to date with news, humour, client showcases, tips and special offers via our regular newsletter!